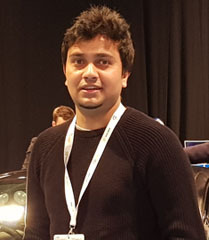 Umer Saleem is a PhD Student in the Institute of Mechanical, Process and Energy Engineering at Heriot-Watt University, Edinburgh UK. His research is focusing on numerical modelling of carbon dioxide flow through sediments into the water column. He is a mechanical engineer with a MSc. degree from Glasgow Caledonian University and has experience as a research officer and a lecturer at the University of Engineering and Technology Lahore (UET).